As parents, we are all familiar with the world of edutainment. We are bombarded with choices daily- from the endless ABC Mouse commercials to the learning description at the introduction to every Noggin cartoon to the countless app ads on our smartphones. How do we know which choice is right for our children? Do these things even work? We are going to be delving into these questions and more over the course of several podcast episodes and articles on www.EngagedFamilyGaming.com. We are going to break the idea of learning into different topics and touch on these concepts separately. We have already talked about board games that help teach Math concepts (Read it here!) The first two editions of our learning through gaming series will specifically focus on Literacy and Language. We will be talking about History and Science shortly thereafter! Before we go into the actual games, we need to discuss learning styles. Your child’s learning style will determine the type of game they will be most likely to enjoy and get the most out of. The three primary learning styles are Visual Learners, Auditory Learners, and Kinesthetic Learners. Visual learners are going to enjoy games with lots of graphics, bright colors, fun artwork, and maybe charts. Auditory learners will enjoy games where they get to listen to snippets of stories and hear others have discussions about different aspects of the game. Kinesthetic learners enjoy games where they get to be hands-on that have lots of pieces to move and manipulate. It’s good to think of the people you are going to be playing with to come up with the best game for your group. While this article and podcast will focus on mainstream family-style games that are available at big-box retailers, we would be lax if we didn’t mention that there is a huge world of board games designed specifically for classroom learning. These games are designed to drill down and reinforce specific learning concepts like letter recognition, language acquisition, phonics, reading comprehension, storytelling mechanics and so forth. Lakeshore Learning and Edupress are staples in the educational field. Please take the opportunity to go onto their websites and search for the topics you were looking to reinforce at home. We’ve played a few games in this style and while these games share some of the common game mechanics that we are familiar with, they do not have the spark that we like to have in our games to engage with our family. Unless you were using your gaming time as a type of additional homework, we don’t find the replay value to be very high or the desire to play to be very high. But, there is no denying that this type of game is a useful learning tool. They at least add a skin of fun over traditional learning. Here at Engaged Family Gaming, we have come up with 12 games that are a lot of fun to play that teach some of these Literacy concepts as well. Scrabble, by Hasbro games, is a classic for a reason. It has retained its popularity through the years (think Words With Friends) because it is fun to play and challenging. In case you’ve never played Scrabble, it is a word game in which two to four players score points by placing tiles, each bearing a single letter, onto a gameboard which is divided into a 15×15 grid of squares. The tile must be placed in a crossword pattern (words flow left to right in rows or downwards in columns). The words must be standard and acceptable words in an agreed upon dictionary. 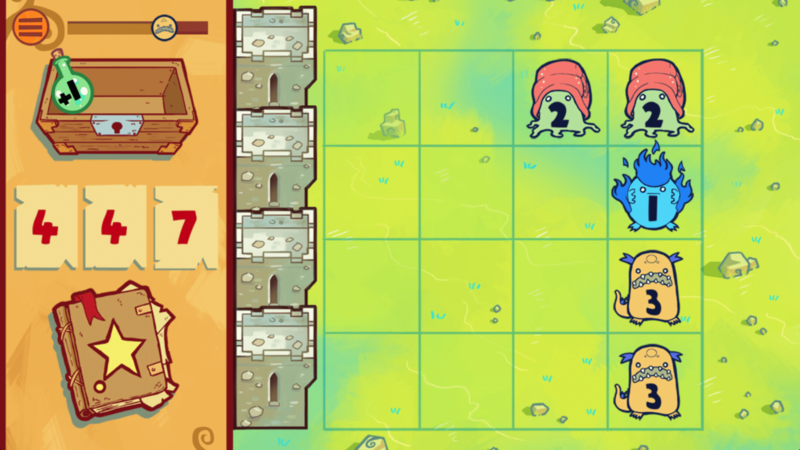 Players score points based on the numbers on their letter tiles and can add bonuses from cues on the gameboard. Scrabble has many variations, including a Junior version designed to help younger kids with letter matching and recognition. This is a great game for kinesthetic learners because there are small pieces to manipulate which these learners LOVE to handle. Bananagrams, by Banagrams, is a similar game to Scrabble, but it doesn’t require a game board, pen, paper, etcetera. It is a letter tile game that comes in a fun banana shaped zip up pouch. It is easily portable and gives you more freedom than Scrabble because you play independently for speed while making your individual crossword board. There are no complications from trying to get the perfect spot on the board, or waiting for a slow player to make a decision, or from losing out on the triple letter space. This game moves quickly because you are working against a clock. There are some unique challenges and ways to manipulate game play which add some fun elements into the game and can allow you to put a crimp in your opponents’ play. 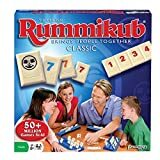 In our playtests of this game, we found that this game can be more of a challenge for younger players because it lacks some of the structure built into Scrabble, but some of your outside the box players will enjoy this one much more. Much like Scrabble, this game appeals to kinesthetic learners because of the tile manipulation. Also, since there is no game board, please make sure to play this one on a smooth surface. The tablecloth became way more of a hindrance during play than any of us anticipated. Rory’s Story Cubes, by Gamewright, is a pocket-sized creative story generator. The original game comes in a box with 9 cubes (dice) with different images on each side. Players simply roll the cubes and let the pictures spark their imagination and tell a story out loud based on the pictures on their cubes. 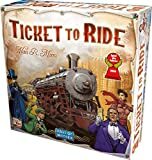 There are several expansions to the base game with different themes (actions, voyages, clues, Batman, intergalactic, etc.). There are infinite ways to play with Rory’s Story Cubes. The rules suggest playing solitaire or with others. The 8+ age suggestion is misleading. This game can definitely be played with younger players. We’ve used this game as a party game or ice-breaker and I’ve used it to work with my youngest on speaking & listening skills. My oldest finds a way to use these as story starters for creative inspiration in his writing activities. They can also help early learners with literacy development and problem-solving. Again, because this game involves dice rolling, it is great for kinesthetic learners. And, because the stories are told aloud, we’ve had great luck honing our children’s auditory learning skills with this game. Finally, because of the creative images on the cubes, this game works as a great inspiration for visual learners. All around, these are a terrific learning tool to add to your arsenal. FitzIt, by Gamewright, is a card based party game where you play a card with a simple statement on it. The player has to name an object that fits the attributes on their cards and then play them to the grid. The more cards you play, the faster you score. Gamewright has a few party games in this style, but we like this one because it is simple to play, plays very quickly, and the statements are easy to read for early readers. Again, the 10+ guideline is a bit misleading. Our early readers love this game because it encourages creativity, imagination, and helps them reinforce their reading comprehension skills. They players’ answers require your child to display an understanding of the words they read to come up an object that makes sense. In a Pickle, by Gamewright, is game of creative thinking and silly scenarios. Players try to win a set of cards by fitting smaller things into bigger things (there’s some juice in a pickle, in a supermarket, in a parking lot). Play the fourth word card to claim the set, unless one of your opponents can trump with a larger word. The player with the most sets at the end is the BIG winner! This game is more abstract than FitzIt and really encourages creativity and imagination. The scenarios get very outrageous and it requires players to think outside of the box and invent options that seem preposterous. The silliness is fun for kids, but we think the 10+ guideline on this one is accurate because of the challenges in making the words fit. In Last Letter, by ThinkFun, each player gets five cards featuring intricate, fun, and brightly colored illustrations. Players must race to come up with and shout out a word from one of the picture cards in their hand. The word MUST begin with the last letter of the word previously called. The first player to get rid of all of their cards will win the round. This game is an awesome game for visual learners! The fast paced nature of this game might make it more challenging for younger players who are slower to process what they are seeing in front of them. If play around the table gets too excitable and loud, you may lose younger auditory learners as well. But, be prepared to be surprised by the creative words kids come up with from the images that adults would not normally think of. 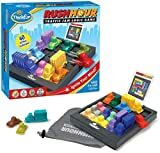 In Smartmouth, by ThinkFun, players race to make the best word in 60 seconds. Players roll the die to determine the word category, slide the Letter Getter to reveal two letter tiles and, using those letters, shout out a word that fits the given category before the timer runs out. The player who calls out the first word and the player with the highest-ranking word both collect a letter tile for the round. Once all tiles are gone, the player with the most tiles wins. The categories of adjective, verb, natural objects, famous people, man made objects, etc. help reinforce language skills learned in school. 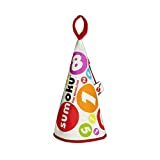 The game includes dice rolling and manipulating the letter tiles and the timer and slider which will appeal to kinesthetic learners, while the picture cues on the dice will appeal to visual learners. Because answers are shouted out loud, auditory learners will be engaged as well. Zingo is a new classic with a few different variations of the game available. It’s like Bingo with a fun twist. The original Zingo is a matching game that encourages pre-readers and early readers to match pictures and words to their challenge cards. The Zingo! Zinger dispenses tiles as players race to be the first player with a full card and yell “ZINGO!” With two levels of play, this matching game builds language skills through fast-paced play. This game is designed to develop early literacy skills for very young players. Zingo Sight Words and Zingo Word Builder are also available and these games introduce more challenging literacy skills. Our children request these games regularly and LOVE to play them. While these are learning games at their core, they use fun and exciting game mechanics to keep young players engaged! Letter Tycoon, by BreakingGames, is word game for 2-5 players that can best be described as a cross between Scrabble and Monopoly. Players take turns forming a word using a seven-card hand and a three-card community card pool, scoring money and stock rewards based on length and letter strength in their word. When enough of the alphabet has been claimed, players finish the current turn, then score all money, stock and letter patents owned. The game has an awesome antique look and style that really appealed to my family. 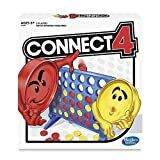 The game mechanics were easy to understand and fun to play, but our younger players had difficulty competing with adult players. The game aesthetic really appealed to us more than other games in this genre and encouraged discussion about some of the historical and antique aspects mentioned in the game. Paperback, designed by by Tim Fowers, is a Word building/Deck building game with an aesthetic that completely immerses players in the world of writing and story building. The cards are uniquely illustrated and fun. Players are supposed to be an author trying to finish kitschy paperback novels. They compete to complete Westerns, Science Fiction, Romance or even a Crime Noir. There is no age recommendation for the game, but we have found that the player should be at least 8 years old to grasp the game mechanics. Players start with a deck of letter cards and wild cards. Each hand they form words, and purchase more powerful letters based on how well their word scored. Most letters have abilities that activate when then are used in a word, such as drawing more cards or double letter score. Players buy wilds to gain victory points. This game functions similarly to the other word building games in this list and emphasized the same skills but it has the added game mechanic of a deckbuilder. Using a deck of cards illustrated with dreamlike images, players select cards that match a title suggested by the “storyteller”, and attempt to guess which card the “storyteller” selected. Each player starts the game with six random cards. Players then take turns being the storyteller. The player whose turn it is to be storyteller looks at the six images in his or her hand. From one of these, he or she makes up a sentence or phrase that might describe it and says it out loud (without showing the card to the other players). Each other player then selects from among their own six cards the one that best matches the sentence given by the storyteller. Then, each player gives their selected card to the storyteller, without showing it to the others. The storyteller shuffles his or her chosen card with the cards received from the other players, and all cards are then dealt face up. The players (except for the storyteller) then secretly guess which picture was the storyteller’s, using numbered voting chips. If nobody or everybody finds the correct picture, the storyteller scores 0, and each of the other players scores 2. Otherwise the storyteller and all players who found the correct answer score 3. Players other than the storyteller score 1 point for each vote their own pictures receive. A large part of the skill of the game comes from being able, when acting as the storyteller, to offer a title which is neither too obscure (such that no other player can identify it) nor too obvious (such that every player is able to guess it). The game ends when a player reaches the end of the board (30 points). Much like Rory’s Story Cubes, this game helps children to learn storytelling skills, story sequencing, and helps broaden appreciation for art and gives players the ability to articulate thoughts concisely and to comprehend metaphor. Iello games has produced a series of games based on classic children’s stories and fairy tales. The games are designed to look like beautiful hardbound storybooks with classically illustrated covers and spines. Each game takes about 20 minutes to play through and they all have different mechanics and designs. They and are designed to be played by players ages 7 and up. We have included them here because they have sparked interest in the classic stories that they are based on in our household. I’ve had to bring my children to the library to find their own copies of these tales to read. The stories released so far are: The Three Little Pigs, Baba Yaga, The Hare and the Tortoise, The Grasshopper and the Ant, Little Red Riding Hood, and The Pied Piper. Interestingly, my middle child was reading some of these stories in his guided reading group, so these were a great tie in to encourage him to discuss the stories and enhance his reading comprehension. 3 DIY Reading Games That You Can Use At Home! Editor’s note: School is coming back into session and a lot of parents are looking into ways to help augment the learning their children are doing in school so I went and asked a teacher what kinds of DIY games she uses to help reinforce learning. There are so many skill that go into reading. Your child needs to practice identifying their letters, learn the letter sounds, read sight words, and learn vocabulary as they grow. Teachers simply cannot do it alone. Parent involvement is essential. So… What can you do to practice these skills with your children? We all want our children to have fun when they are learning. This will make them WANT to practice. Even better is when we can engage them without having to spend excessive amounts of money on pre-made products. In fact, simple games can be the best way to practice skills. Some of the simpler games and toys you can buy can be turned into literacy games easily (you might even have some of them lying around). I have a collection of games for my students to use during “center time.” There is a component to the games that you do not get with a worksheet or workbook, and that is the discourse. We make sure to orally read the word or letter while playing. Naturally, this encourages conversation which has the potential to enhance the interaction,whether it is parent – child or child-peer, in immeasurable ways. These simple literacy games are highly motivating. The children will be having so much fun playing the game and won’t even notice they are learning! Here are three of my favorite. I have different sets that I have made or purchased. The Candy Land game board ( or any “path” game board really) is simple to turn into a customized learning game. You have two options for customization: you can change the deck of cards or alter the board. You can change the deck by using white out tape to add sight words. Perhaps your players might need to read the letter or word to be able to move the correct number of spaces? Alternately, you can use white out tap (or stickers) to change the board to add the same. When they land on a space, each player has to read the word or letter or be sent back. You could also use notecards and write two words on each card to make a set of dominoes. Just like in the Candy Land game above each word needs to be read/defined when they are played. Another way I use dominoes is with rhyming words. The words must rhyme to make a match. The same concept can be used for vocabulary, synonyms and even antonyms. Memory is a game which can be used with a wide range of ages. It is so simple that you can start using letters with 3-year-olds. Once they know their letters you can use the same cards to work on letter sounds. Just like dominoes you can use them for sight words, rhyming words, synonyms, antonyms, and vocabulary words. The greatest challenge making memory cards is to be sure you can’t see through the paper. To minimize it you have a few options. First, you can use a thicker paper like card stock. Second, if you print the words on labels and stick them to the notecards that my help as well. Third, a dark colored paper is harder to see through. These games give you a wide range of options to practice skills with your child in a fun engaging way. Proviron is a synthetic androgen, which has anabolic properties. Proviron used in medicine in the treatment of sexual dysfunction and impotence, also sometimes used to increase sperm count. Widely used drug among athletes. Take Proviron at the end of steroids to reduce the production of testosterone. After all, the drug does not have the slightest impact on the natural production of testosterone and almost completely eliminates the disturbances caused by the testosterone deficiency. With the cessation of steroid Proviron course raises a reduced sexual interest and potency. But mass and strength gradually disappearing after the course, the drug will not be able to save. For these purposes, there are many other drugs, so many call it useless. But there is an opinion is only among people who do not know the main advantages of Proviron. After all this preparation is the enemy of estrogen, preventing the aromatization of steroids. Strong bond to plasma proteins allows proviron online enhance the action of other drugs taken. Unlike other anti-estrogen drugs simply blocking receptors of estrogen, proviron for sale prevents aromatization of steroids themselves, in consequence of that, you can throw away all fears about gynecomastia and the accumulation of excess water and salts in the body of the athlete. Proviron strongly suppresses the occurrence of estrogen, so that finished taking the drug, you will not see the opposite effect, as is the case with other similar medicines. All products factory quality. You can buy it on the phone and through the basket. If you have difficulty in choosing which to buy proviron, you can just get a preliminary consultation with our specialist. Price Proviron each manufacturer has its own. Some athletes prefer to buy products of only one manufacturer. Such devotion to certain brands we understand. Typically, the factory goods contains the verification code on the packaging. Thus, you can easily verify the originality smozheet products. Proviron price of the drug, as well as the reviews are listed on product page. Feedback from using Proviron, athletes achieve better muscle hardness. This is because increased levels of androgens, but the number of estrogen remains low. Reviews say that the above features particularly pronounced in combination with a diet during the precompetitive period. The side effects of Proviron in men at a dose of two to three tablets are extremely improbable. So combining Proviron with taking steroids (steroid cycle) may be safe to take more than a few weeks. Proviron is well tolerated by the liver, and if you stick to the recommended dosage will not be any discomfort. A long time ago, when I was a child myself, tic-tac-toe was an endless stream of winless frames. My mother showed me the most amazing game that could ever be played on the back of a restaurant placemat. She began by using a pen she kept in her purse to draw what seemed like an expansive square of deliberately spaced dots and instructed us to use the three restaurant provided crayons to begin drawing one line at a time between them. We obliged, and soon, she had closed off a square and emblazoned the intervening space with the ominous and forever taunting letter, “M” (for mom). Once we caught on to this plot, letters began to appear everywhere, before we knew it, our primary colored maze of squares and line segments was a resting place for the bright orange of macaroni and cheese and the chocolate laden smiling face of an ice cream clown. Since this isn’t a review of that simple, on-demand game that parents everywhere use to hasten the apparent time between ordering and the arrival of unnaturally colored cheese. You are probably wondering why I am taking this trip down memory lane. Well, Three Sticks is basically what you get when you combine the original dot-matrix design (yes, I know what I did there) with Scrabble-like point gains and variable sized pieces. Except, instead of making a simple square of area 1 unit2, you are attempting to build much more complicated and interesting polygons. This isn’t your mother’s dinner distraction, this is a forward-looking strategy game with points based on the shape, it’s perimeter (you might have to remember that from school) and how unique that shape is to the game (has it been played before). Also, there are Scrabble-like bonus points scattered around the board to give you a chance to take your score even higher. The board consists of a 26×26 grid composed of dots (way bigger than any board my mother ever made), bordered by 4 color-coded number lines for each player to keep score as they work to reach the ultimate, game ending score of 500. What’s interesting about this line is it uses 3 tokens to keep track of 10’s position, so were you to score 114 points, you’d move one token to 100, one to 10 and the last to 4. It cuts down on the space needed significantly and helps to promote better understanding of multiples and 10’s and 100’s place counting and addition for higher numbers. It’s an innovative method for score-keeping that also promotes a different way of thinking about large number addition. To begin the game players are dealt 5 “Power Cards” that they keep for the duration of the game. They also select one “Reload” card that provides them with some combination of 6 sticks for use on their turn. Sticks come in three varieties, hence the name of the game, a 3-unit purple stick, a 4-unit orange stick and a 5-unit red stick. The sticks may only be played if they are end-to-end with another already placed stick, and only the red stick can be played at an angle. If you remember your trigonometry, you might recall this Pythagorean triple. If not, when a segment with a length 4 intersects at a right angle to a segment of length 3, the resultant triangle will have a hypotenuse of 5 (a2 + b2 = c2). In non-math, if a purple stick and an orange stick are aligned at their edges where one is vertical and one is horizontal the red stick will make it a triangle. The oldest player goes first (because they are at a first turn disadvantage unless they have power cards to help them to score) and has a series of actions they can take. Unfortunately, this is one of the parts of the game that needs some polish, as it is unclear whether the actions must be taken in the order given, or not. We assumed they should be, which made some of the power cards work poorly on their own. First, if the player has no sticks, they may draw a reload card to gain 6 more. Next, a player may play a stick, for the first turn, an end of that stick must touch the central “X” of the board. On subsequent turns, if that stick makes a shape, it’s scored. Then another stick may be played, which will trigger another scoring. After this is complete, that player may play up to two power cards from their hand. Power cards add mechanics like “Skip”, “Gain two sticks”, or “Play two more sticks” to the game. They can even allow you to play sticks completely independently of the board or to manipulate points. Once the player has finished the turn, play moves on. When a shape is made, if it is the only shape made by that stick, it is scored simply with the method above. If it creates more than one shape, the active player must determine the highest point shape they can be credited with to gain the most points. This deliberation and puzzling out can take some time, and the more disparate the level of the players, the more frustrating this can be. With younger players, it helps to point out the shapes and let them determine the highest point values from your calculations. Older players have the ability to look forward and to plan moves to trick opponents into giving them higher point plays, also older players are more aware of multi-faceted shapes and how they can vary, whereas younger players will need that explained and will require assistance. Adding the perimeter to the point calculation is also quite ingenious, it strengthens the child’s ability to understand the concept of a shape’s size and it also gives them a visual relationship to the term. With a younger child, I’d suggest either not using this calculation or doing it for them. Having the child recognize the bonus shape on the poster will help develop the understanding of higher tier shapes, and larger numbers. Older children can have it taken a step further, for an added challenge, have the child calculate points in area of the shape as opposed to perimeter, this variation could allow for reinforcement of multiplicative skills, as well as a better grasp of how to assess area for abnormal shapes. Overall, Three Sticks is interesting and could be a lot of fun with a well matched group, or with very patient adults among children. Of course, if you are like many people, you probably don’t remember much about polygons (beyond that octagon you accidentally forgot to stop at this morning) and likely wouldn’t know a parallelogram from a decagon if it bit you in the rhombus. (Editor’s note: Yes. I AM sorry I had our resident mathlete review this game. I’ll try to better next time. – Stephen ) Well, lucky for you, Three Sticks includes basic descriptions and pictures of these shapes (in their most ideal forms) to help guide you to geometric maximization. Three Sticks is currently on Indegogo – check it out here! Need more math games? Check out our math-related games! Looking for more educational games? Check out our list here. This is the best thought I could think of to describe the game of Dixit, a game where it appears that players are making sense of nonsense! Dixit plays like Apples to Apples in the opposite direction that is far more visual. It requires that you to come up with a perfectly apt description of your own VERY surreal card that also leaves your opponents guessing. The trick is, the description cannot be too easy or too difficult because at least one person needs to get it right for you to score. It is very likely that you are confused at that description. (I know I was the first time I played!) Let me explain the game play and then, hopefully, it will clear it all up! You could say “A boy with bubbles traversing hills”, but it’s not likely anyone else would have a card that would match that description. As your opponents selections are sorted out, they secretly vote for the card they think is yours using color coded chips. If everyone guesses your card, all your opponents gain 2 points and you gain none. Let’s say you wanted to make it harder, so you just say “Green”, as it is likely that most of your opponents would have a card fitting that description as they play a card from their hand. However; if no one chooses yours, as there is a “greener” card available, your opponents all gain 2 points (plus a bonus for anyone whose card was chosen by others) and you still get 0! There is a third option, and this is your goal! 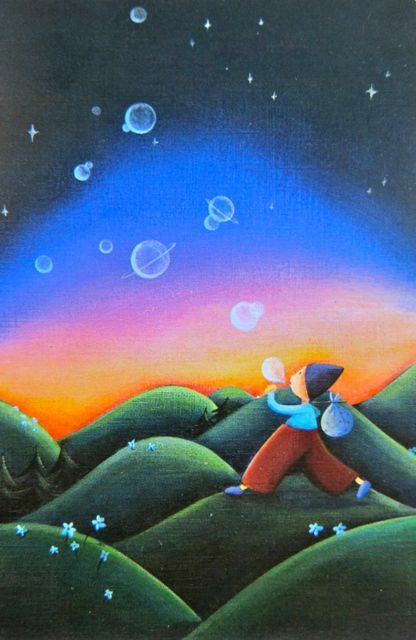 Let’s say you said something like “The Final Frontier”, alluding to the Saturn-like shapes of the bubbles, and the fact that the child is obviously traveling. There may be better options out, or not. If one person guesses my image, I get 3 points and they get 3 points, plus a bonus for anyone choosing their card. All other players get 0. The game is played until someone’s rabbit-shaped meeple reaches 30 points on the board! Dixit is an immensely fun game, and it is VERY family friendly. Since there is no reading involved, young children can play, however; expect them to be more of a “wild card” to your strategy. I’ve played 5 or 6 times with my 4 year old and only the last time did she start giving clues that didn’t directly describe the card! I would recommend a lot of patience with children under 7 or 8, but once they have the hang of it, it’ll be worth it! This game helps children to learn storytelling skills, helps broaden appreciation for art and gives them a very strong ability to articulate thoughts concisely and to comprehend metaphor. If you are looking for a tool to help your child facilitate story telling, Dixit cards can be used similarly to Rory’s Story Cubes. Randomly select cards and ask your child to tell a story about what is happening! I have recommended this game to friends who do not describe themselves as “gamers” or as liking games because it is very simple and very entertaining once you have the hang of it! Much like Apples to Apples there is a lot of replay ability in the 84 card set, though eventually, you might want to look for more options. Asmodee currently has 4 readily available expansions that each add 84 cards to the base set. They even designed the box to accommodate expansions! All-in-all, Dixit is a must have staple for all family game shelves! Tallahassee, Florida, and Washington, D.C.
Santa Fe, New Mexico, and Nashville, Tennessee. Who can forget the immortal words of the genius that is Wakko Warner, as he fiddled his way through the capitals of all 50 states? Sadly, since the retirement of the Warner Brothers (and the Warner sister), there has been a severe lack in fun ways to learn geography! Have no fear! State Master is here! State Master is a quick competitive game that allows children to learn state trivia in an engaging way! It’s like the U.S. State version of trivial pursuit with the initial roll mechanic of most board games. Each of the 50 state master cards are double sided, with the state flag & name on the front and six state facts on the back. To play State Master, five cards times the number of players are placed flag side up ten for two players, thirty for six, etc.) as well as a blank political map of the United States (which is labeled on the back). Players then chose their dice and roll, seven dice are provided, six different colored dice that basically act as player’s pieces and one special die. The person that rolls the highest places their die on the state of their choice and so on down – the instructions do not provide any guidance on ties, so we rerolled ties – though whatever your house rules for ties are would work fine. Each player must then answer for their state. If they are correct, they must then chose their state on the map, in order to win the card. Each round progresses the same way until their are fewer cards on the board than there are players in the game. State Master is overall a pretty fun game in the educational realm, and I was surprised at how little I knew, even about my home state! It definitely has some great learning and memorization potential and the cards could even double as flash cards if you were so inclined. Replayability will likely be high for a while until your children have mastered most of the data, however; in a classroom setting, this game could be fantastic and would likely never grow old. There is no age range for this game, which makes sense, as you could easily read the answers to a younger child, though reading at a moderate level would be required to play independent of an adult. All in all, State Master is a fun and well thought out game that has a price point of $15 or less (if you get in early) and is worth it for helping your child learn more about the country we live in. State Master is currently on Kickstarter and will end its campaign (appropriately) on July 4th! As Wakko would say it’s “Faboo”! Racing into a growing spiral, faster and faster as the magnitude increases monotonically. Decahedrons, your only ally to your nigh indivisible goal, the Prime goal, one-hundred-and-one. Prime Climb is a game of decision making and strategy that has you competing with your opponents to get your pawns to the safety of the board’s final number. As if it were the progeny of Sorry! and Chutes and Ladders, Prime Climb employs both the sequential numeric board, a single occupant mechanic (where you might be compelled to say “Sorry!”) and a “Home base”-esque aspect for the space labeled 101. Prime Climb utilizes all of the simplicity of these classic games, but it offers far more depth! Doubles also provide a twist, when two identical numbers are rolled, players have four copies of that number to use on their turn! Roll two 9’s, you can take one pawn to 81 from 0, and the other to 18, and so on. The single occupier rule also applies to your own pawns, so it’s worth remembering especially in this case. The biggest difference is the board, it uses six different space colors (seven if you count black at the 0, or starting space). Grey, orange, green, blue, purple, and red adorn a black board arranged in an Archimedean Spiral, however if you were looking for a Candy Land-esque repetition you are in for a surprise! Prime Climb uses these colors to represent the first of the early primes. Orange represents 2 and all factors of 2 that follow have an orange segment in their space. So, four would be split with two (2×2) orange halves. Three is green, so the six space (3×2) is half-orange, half-green, and so on! Red spaces are reserved for primes, and as numbers increase to have higher magnitude prime factors, those numbers printed in the red space of the factor. Primes have the added bonus of allowing you to draw a card that adds some additional effect to your turn (or a future turn). That’s right, Prime Climb uses color to represent prime factorization! This innovative method of teaching children how to multiply and divide allows even young minds to engage in learning via pattern recognition. To test out the idea that this could work with a younger child, I played with my four-year-old daughter, who loves patterns and can only add and subtract numbers up to 10. After studying the board and explaining to her how it worked, she invented her own basic game — she decided to determine the factors of the numbers in her fortune cookie (You know, those 6 lucky numbers that are printed under the Chinese word for Shoe). She was able to follow the spiral, and identify all of the factors of each of the numbers (though I’ll admit that the first three were 7,19 and 43 so that did make it easier)! When we played the game we had to assist her with determining where she should move, since the decision making process with two pawns is far harder than you’d expect once you’ve made it to the larger numbers! But we were able to show her where she could move by teaching her to look for the colors! As an example, let’s say you were on 6, it has factors of 2 (orange) and 3 (green), and you rolled a 7 (purple). To determine where 7 would take you if you multiplied, you just need to find the first space that has three segments in orange, green & purple which is 42, the product of 6 x 7! It takes patience to play it to a younger audience, but it is definitely a possibility to help introduce the artistry of mathematics to a child before they learn it as rote memorization and “plug and chug” problem solving. All-in-all Prime Climb is a fantastic family game for the mathematically inclined and for those who like fun. I was lucky enough to get a print-and-play review copy to check out while it runs on Kickstarter, and you could too! The print and play runs $15 and comes with a matching multiplication table and hundreds chart, for the full game experience you can back at the $35 level and get those same printable files! Prime Climb is fully funded and on their way to some great stretch goals! Check them out before the campaign ends June 6th! Have you ever dreamed of being an enzyme? Do your thoughts drift to Adenine, Guanine, Thymine and Cytosine more than you’d like to admit? Have you ever wished you could act just like mRNA? Well, you’re in luck! Linkage is a fast-paced game of DNA transcription… that’s right, DNA transcription! Players create a shared strand of DNA from a deck of beautifully designed nucleotide cards, and then use their own hand of RNA nucleotides to try to match it. It’s as easy as protein synthesis! I know what you’re thinking, “I left my DNA Helicase in my other genome”! It’s OK, you won’t need it with this game! Gameplay starts with each player drawing 4 cards from the RNA deck, and laying out the DNA promoter next to the DNA deck. The promoter starts the nucleotide sequence that you will need to try to match to when transcribing your strand. Each subsequent DNA card has a secondary color that corresponds with the color of the RNA nucleotide cards in your hand. Play starts by laying the first card of the DNA deck next to the promoter, the oldest player then must draw a card and must play a card. Of course, the goal is to match the laid down DNA card, however, that may not be an option! Once a card is played, the next player completes a draw-play turn. The turn ends and the next nucleotide is drawn in the DNA strand. Since RNA transcription is never as simple as it sounds, there are some other mechanics at play. Chaperone cards act as a wild card and can replace any active nucleotide in your strand, DNA Mutation allows a player to switch out a card in the DNA sequence and any RNA card marked as a Mutation can steal a card from someone else’s RNA strand. The round continues until the Terminator (no relation to John Connor’s T-800) is drawn. Players then add up their points for the round, gaining points for each card in the sequence that matches the parent strand, and racking up bonuses for long strands. Currently, there is no suggested “best play” number of rounds, but our test went well with three. Playing like a classic card game, Linkage is very much a learning game that puts the entertainment in edutainment. Color matching lends to play with younger kids interested in science, while the more complicated strategic mechanics will keep older kids ribosomes revved up for transcription! I can’t imagine a better game to teach budding scientists (or even those struggling with the concept of Uracil as a general agent of confusion) some tough concepts through play. Though many of the mechanics seem advanced, little reading is necessary, as the game can be played via symbol and color recognition. Children who have mastered games like UNO and Phase 10 might struggle a little with the DNA Mutation and Chaperone cards, but would be able to grasp it after a few rounds of guided play. Now that the Kickstarter has ended, Linkage has a $19.99 price tag and is available here!